One of the really fun things about reliving past performances is reconnecting with some truly great and fun productions. One such show is the 1997 Crossmen production of "The Colors of Jazz." For the second time in corps history, (the other being 1992), Crossmen broke into the top-six at the DCI World Championships with this show, knocking off two-time World Champion the Cavaliers by 0.20, 93.00 to 92.80. This was the corps' highest score ever in a DCI show and put the cap on a banner year for the corps. Consider this: In 1996, Crossmen, tying for eighth place at the World Championships with Magic of Orlando, scored 11.90 points under the winning score. In 1997, even though the winning score went up one point higher than the year before, the corps scored just 5.4 points under the first place corps. The opener of "Birdland" was perhaps the quintessential Crossmen piece; the corps performed it in 1996, 1997, 2000 and most recently, in 2007. The quick falling diminuendo (literally meaning "diminishing") just a few seconds from the start of the accompanying clip was astoundingly effective and as you'll hear in the clip, always got the audience to hoot and howl. About a minute and a half later, the 16-count diminuendo also had a unique affect on the audience. Watch in the clip how the silks of the flags suddenly disappear at the very end. Performance excerpt of the 1997 Crossmen. I suspect that part of the reason these diminuendos were so effective, is that one tends to expect music at a climax to suddenly become louder. Crossmen's staff realized that by turning the tables on expectations, they could create a unique effect that was thoroughly unexpected. Even after witnessing it a few times, it's still a joy to hear every time. Another fun part of this production is the continuous and genuine joy expressed by the color guard members. Sometimes joy seems forced, as if a guard staff instructs the members, "Your purpose is to rejoice! Now get out there and rejoice!" Not so in this guard. One could tell they were really enjoying getting their cardio workout. Everything in this show worked for entertainment value. "You Are My Sunshine" featured a choir-robed member inciting the congregation (audience) to get into the groove and let the celebration move them. Check out the close-up of the subtly soft conga player at the beginning of Don Ellis' "Niner-Two." The creative staff was quite aware of the power of subtlety when constructing this show; the extreme softness with which the conga drummer was playing added to the other soft dynamic levels from other percussion instruments added up to a richly varied texture that continually crested and ebbed through much of the closer. This was one of those pieces where you wonder how challenging it must be for a corps to march to such a rhythmic meter without occasionally getting their feet on the wrong beat. At the end, the brass and percussion sections really cut loose, and the power thrown at the faces of the audience was all the more effective for the restraint shown in so many prior moments. As during much of the opener, the closer worked so well partially due to the dynamic contrasts, exploiting all volumes. The 1997 Crossmen is a great download to have available on those overcast days when you truly need a little bit of the sunshine that lit up the field throughout this entire show. This week only, you can save on 1997 World Championship Audio and Video Performance Downloads on the DCI Fan Network. 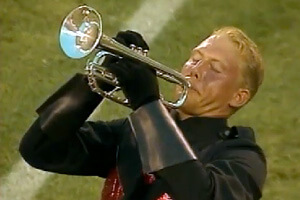 Buy the 1997 Crossmen Video Performance Download. (Available this week only for $3.99. Regular price: $4.99.) Buy the Audio Performance Download bundle of all 12 Finalists from 1997. (Available this week only for $15.99. Regular price: $19.99.) Offer ends Monday, March 21 at 8:30 a.m. ET.